There are many places throughout the Accounts Receivable package where you will need to enter a General Ledger account number to designate where some transaction amount is to be recorded. To reduce the number of data entry mistakes, when a user enters an account number it is checked against the A/R Account File to verify that it is a valid account. If the account is not on file, you will be informed of this and allowed to enter another account number. In all of the examples that are given here, an account number with 5 characters in the main account number, 5 characters in the profit center number and 5 characters in the department number is assumed. However, you may have defined your G/L account number to be of some different format. 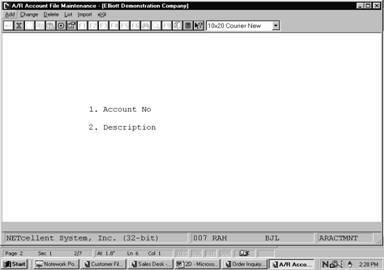 Entry of the account number throughout Elliott will conform to the format that you have established in the Company Setup. This is basically a very simple application. All you have to enter is the numbers of all of the accounts you expect to use during A/R proces­sing along with their descriptions. The Import application will allow a range of accounts from the General Ledger Chart of Accounts file to be imported into the Accounts Receivable Account file. This selection is only if the Elliott General Ledger package is installed. Enter the number of the account. The account number format is specified here as XXXXX‑XXXXX-XXXXX, that is, an account number with 5 characters in the main account number, 5 characters in the profit center and 5 characters in the department number. If inCompany Setup you specified a different format of your G/L account number, Elliott will know to reformat the entry field accordingly. Enter the characters of the main account number and press RETURN. The hyphen (‑) will be displayed automatically between the main account number and the entry field for the profit center and department number. Then enter the characters of the profit center and department number and press RETURN again. In the change or delete mode, press the F7 key to search for an account number or press the F8 key to search for an account by description. Enter the description of the General Ledger account exactly as you want it to appear on data entry screens and on Accounts Receivable reports. This question and the next one (Ending Account No) allow you to specify a range of accounts to be imported from the G/L Account file. If you press RETURN for the entry of the Starting Account No, the field will default to Allaccounts, and the entry of the Ending Account No will be skipped. If you press RETURN for the entry of the Ending Account No, the field will default to the same value as entered for the Starting Account No.